The French train attack 'hero' Alek Skarlatos was enrolled at Umpqua Community College. (Thanks to AkhaldanSolo for the links). Is the CIA recruiting false flag operatives at umpqua community college in Roseburg in Oregon? , a Briton and two Frenchmen, allegedly stopped the 'gunman' on the Paris-bound train travelling from Amsterdam via Brussels in August 2015. 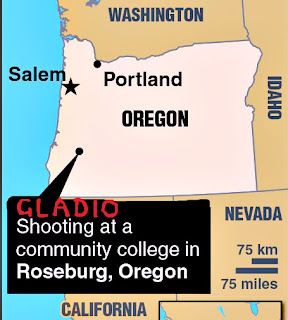 Reportedly, Operation Gladio-style false flag operations, such as those at the Oregon college and on the French train, are part of the CIA's Strategy of Tension. The CIA shootings and killings in Italy, Belgium, Denmark, France, Germany, Greece, Netherlands, Norway, Portugal, Turkey, Austria, Finland, Spain, Sweden, Switzerland had nothing to do with promoting gun control. The Strategy of Tension is designed to keep the rich elite in power and to advance their conservative right-wing agenda. The Oregon shooter, Chris Harper-Mercer, did U.S. Army training. In 2008, Chris Harper-Mercer was in service at Fort Jackson, South Carolina. During training, Chris Harper-Mercer may have met army veteran Chris Mintz, who was also involved in the Oregon shooting? In 2015, in the USA, there have been nearly 300 mass shootings and almost 10,000 people killed by guns. The Washington Post points out that there hasn't been a single week during Obama's second term when there has not been a mass shooting.